When we make some advancement in technology, engineering or mathematics, the natural reaction is to run wild with it and apply it to everything. That's why you can now wear a watch that has more computing power than the lunar modules had during the Apollo flights. Your tablet has more computing power than mainframes had when I was learning COBOL and Fortran. So when the FBI developed the ballistic test protocols it is so proud of, a lot of people took them as gospel. We are now to the point where the first question posed to any new brand or type of ammo is "How does it do in the FBI tests?" While the FBI tests are good, you have to keep in mind that the gelatin used is a tissue simulant. It isn't real, it isn't live, and its one main virtue is that it is consistent. Properly mixed and used, it will produce the same results regardless of where and when you test a given cartridge. A cartridge that scored higher on the FBI tests probably is better. But that isn't a lock. Liberty's Civil Defense ammo features a very light-for-caliber, all-copper hollowpoint bullet pushed at high speeds. The design results in petals that break off and track away from the base, which remains intact. That's a long way to get to Liberty Ammunition, but I want you to keep it in mind as we go. Liberty Ammo loads a line of handgun ammo it calls Civil Defense, a line that includes .380, 9mm Luger, .40 S&W and .45 ACP. In all four calibers (the 9mm and .45 ACP are +P loadings) the loads feature lighter-than-usual bullets, which are constructed of copper. Yes, there are other all-copper loads on the market, but they're not this light. The .380 and 9mm use bullets of 50 grains, the .40 uses a bullet of 60 grains, and the .45 ACP bullet is a wispy 78 grains. Those of you who have pored over loading stats and religiously read velocity and energy figures are saying "Oh my, those have to be going pretty fast." You have no idea. The 9mm and .40 are listed at producing 2,000 fps, the .45 is over 1,900 fps, and the .380 is good for 1,500 fps. The Liberty Ammo bullets are monolithic copper hollowpoints. To get them down to the listed weights, the hollow cavity is basically the entire interior; the bullets look as if they were just very heavy-jacketed bullets that somehow got made without their lead cores. The intent was not to make a "lead-free" bullet, but rather the lack of lead was a purposeful effort to make a high-velocity cartridge with a fragmenting bullet. I started my examination of loads from Liberty Ammo by shooting them over the chronograph. 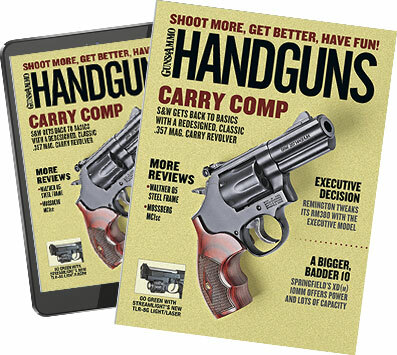 I can't tell you I was all that enthused about touching off such warp-speed ammo, and I chose my toughest handguns for the project—basically the ones that would be least expensive to repair if something went awry. I need not have worried. The empties flew the correct distance and direction, and the brass did not look out of the norm. I don't put much faith in so-called "pressure signs" in handgun brass, but these looked just fine. The loads I was most interested in were the .380 and 9mm. They delivered as promised, sometimes more. The 9mm delivered more than 2,100 fps out of a five-inch 1911. Recoil was not any more than you'd expect from a 9mm, and the muzzle blast was a bit sharper than other loads but no so much that on the shot people around you ask "What was that?" The bullet performance was, well, different. Which brings us back to the FBI tests. If you hold the FBI tests to be revealed wisdom, then the Liberty Ammo Civil Defense loads will be seen to have failed miserably. As I mentioned, the hollowpoint on the Liberty Ammo bullets is really deep and quite wide in the interior. Upon expanding, the shell of the ogive peels back, splitting into numerous petals, until the petals shear off at the base. The petals veer off on their own track, spreading out from the axis of the base travel direction while the base, now a disk of copper, continues forward. Both the 9mm and .380 feature 50-grain bullets. The .380, with less velocity and energy, doesn't always peel off petals as consistently. When I test an absolutely new load, I first try it in water to see what I get. Water, in the form of one-gallon plastic jugs, acts close enough to ballistic gel, in a limited spectrum of testing, to give me an idea of what I'm in for. I did not find a complete set of petals on the first shots tested. The splashing water of the jugs washed some of them off the table. Some, I'm sure, exited the jugs and disappeared. I did find some on each shot, however, and some others stuck in the plastic of the adjacent jugs, meaning they had the velocity to exit the impact jug and still had enough velocity—even after peeling off, passing through the water and exiting the first jug—to imbed themselves in the exterior of adjacent jugs. That's not nothin'. I returned to the range with more jugs and a test bin. By placing the jugs in the bin, I was able to capture all the petals on subsequent tests but not all the bases. For being "just" a small disk of copper, averaging 28 grains once the petals shear off, they penetrated quite well. Several exited the heavy plastic bin I was using to contain the jugs and water. The rest consistently created eight petals—small copper curls looking remarkably like quotation marks—that curled, broke off and then spread out. Now, this is an extreme test for these Liberty Ammo bullets. You see, using water as a simulant has its own limitations. And one of those is that the boundary for clear comparison ends in the 1,500 to 1,700 fps range. Below that, we can pretty accurately predict from water what a bullet will do in ballistic gelatin. Above that velocity range, the plastic jug/water combination is actually tougher on bullets than gelatin is. In gelatin the bullet will most likely peel and shear as seen in the water. The juncture between the petals and the base is too small to allow them to stay attached. The base, in the 9mm a consistent 28 grains, will drive straight on and exceed the FBI minimum threshold. The petals will track off the base axis, in a cone, and travel at most to six inches on that expanding cone—beginning not from the impact point but at the depth at which they shear off. I don't expect them to penetrate 12 inches. The FBI would view this as a failure. Me, I'm not so dogmatic. With less velocity and energy, the .380 does not always peel off the petals as consistently. I would not expect even the base to penetrate 12 inches, but then it is very rare that a .380 does. The Liberty Ammo Civil Defense .380 loading creates fewer petals, but they are still on their own cone-shaped path. If I were a law enforcement officer who had to deal with criminals in cars and trucks, this would not be a very good choice. However, inside a house, protecting the family, and with walls between me and mine, I'd want something that was less enthusiastic about barrier penetration. Liberty Ammo Civil Defense seems to be very useful in a situation such as that. Light clothing would probably not make a difference, heavy clothing might, and this certainly bears additional testing. If you want ammunition for a special use and are not prone to worshiping at the altar of the FBI tests, then Liberty Ammo has some interesting options for you.